Since 2000, the Serpentine Gallery has annually commissioned a leading architect who has yet to build a project in England to put on a temporary summer pavilion. At 41, Sou Fujimoto was then the youngest pavilion designer to be appointed. Built on the lawn outside the Serpentine Gallery in London's Kensington Gardens, his all-white pavilion - crafted from 28km of thin white metal tubing which was cut into 27,000 sections and joined together to form lattice blocks - was likened to a soft, ethereal cloud by design and news publications. Visitors could walk on or under it and sit on its lower levels on printed glass panels so they appeared to be floating on air. Overlapping clear discs covered the top of the structure to protect its users from the rain and also reflected sunlight. The pavilion opened in June 2013 and closed five months later. Those who walk by this property in Tokyo might think construction is still in progress. There are no obvious brick walls and its white steel-frame structure looks more like a scaffolding fixture. But the 914 sq ft house is finished. Fujimoto turned to nature for inspiration, modelling the structure after a tree with its branches spread apart. There are different levels and areas within the house - connected by fixed and movable stairs. The furnishings are bare: aside from the thin white-tinted birch flooring, curtains have been put in and can be drawn for privacy. And instead of regular brick walls, those that exist are clear glass panels. Every horizontal surface doubles as a desk, shelf, bed or chair. 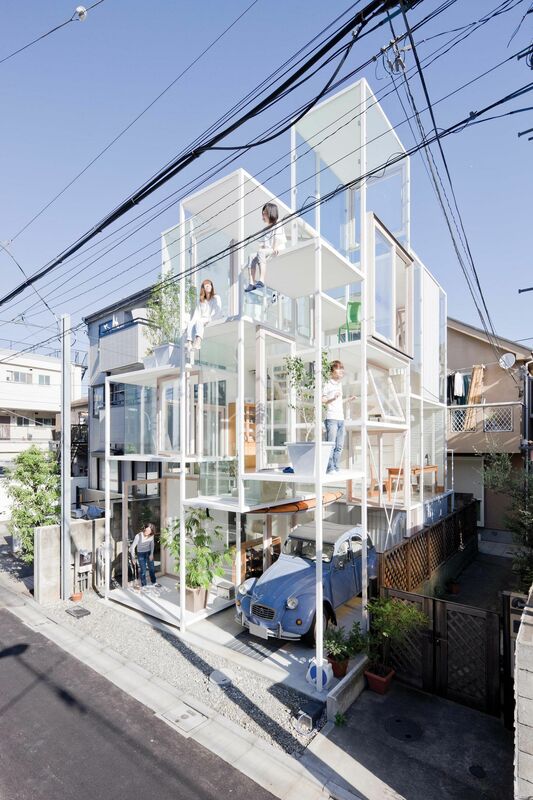 Call it off-the-wall architecture, but it is a classic Fujimoto work. Lots of light shines through; it plays on the notion of a forest; and it is a structure that pushes conventional ideas. 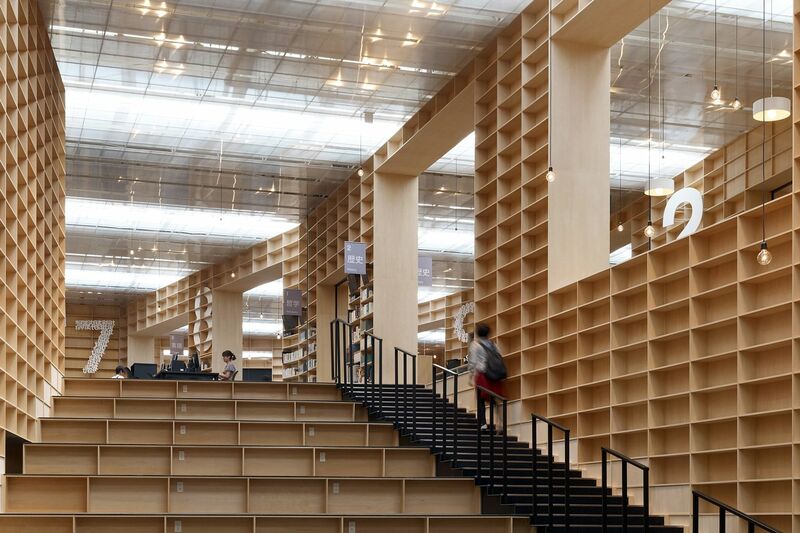 It would be any bookworm's dream to be inside this library, housed in one of the best art universities in Japan. Rows of towering bookshelves fill the double-storey library that takes up 6,444 sq m.
It was designed in a spiral, with different-sized openings at various points so visitors can roam freely within. The light-coloured wood shelves are also partitions, while some shelves are "punctuated by large apertures", as Fujimoto said in past interviews, to bring in plenty of natural light. Reading areas are connected to one another by small bridges, while a bleacher-like area - where librarygoers can sit and read - can also be turned into an auditorium space. Outside, more shelves make up the facade, though they are covered by planes of glass. Half of the 200,000 titles in the library are placed in the open-access area, while there is an archive in the basement. This is nestled in the outskirts of Guangzhou, China. Fujimoto took inspiration for this project - which he collaborated on with experimental Chinese contemporary art gallery Vitamin Creative Space - from surrounding villages. Blockish houses of different heights and appearances sit side by side and are used as exhibition galleries. Some were furnished with locally sourced materials such as old roof tiles from the Qing dynasty, which were salvaged from an old warehouse that stood on the site previously. Outside, plants and shrubs grow wild. 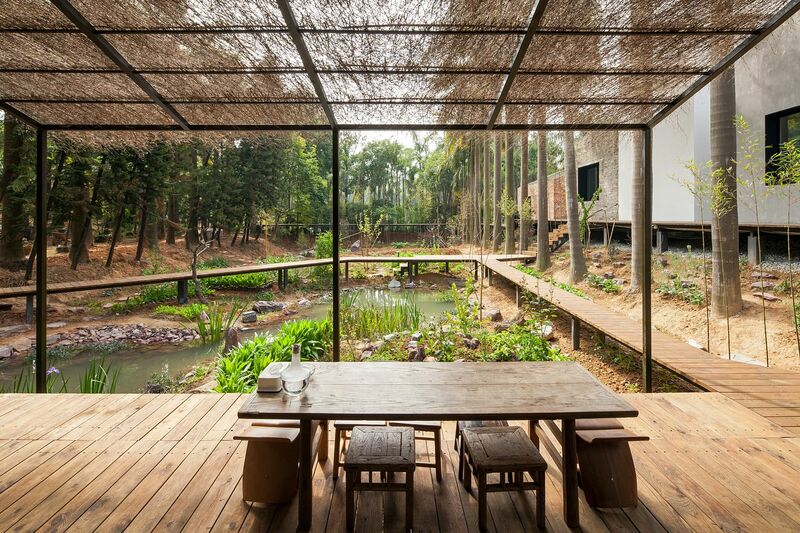 For a quiet moment, visitors can rest under a thatched structure overlooking a pond.